This is not at all a running vest. 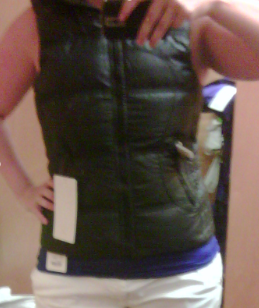 Not even the slightest bit possible as this is a warm, very warm 600-fill-power goose down vest. I did really like it though as the fit was not poofy and it had a drawcord inside the pocket where you can cinch up the waist for more definition (this is uncinched) It’s got DWR (durable water resistant) finish which means that it beads up water but it doesn’t actually repel water so if your caught in a rainstorm it will soak through. It’s good though from running from your car into the grocery store in rain but not so much for hanging out outdoors in inclement weather. It’s reversible but the other side is the same color, just different seam patterns which annoyed me because I would have gotten the pink or citron one if it had a coal inside just so that I have the versatility of having a neutral and a stand out color. Would you believe that I forgot to write down the price? I know it was more than the Community Jacket though so I want to say it was about $159ish. I think I may end up getting this as I really liked how nicely it fit and it’s something that can go over top of a Stride. The one I have on in this picture is a size 10. the 8 looked similar as well so I would probably get the 8. So what did I get today? a very boring purchase but one I’m happy with. I ended up with the Circle Mesh CRB (seen in all of these personal fit review pictures layered underneath) as I love the color on me and I think it’s my all time favourite. I found it to be a snugger fit so I got it in a 10. I also snatched a lolo skinny satin headband. "Community Jacket – Personal Fit Review"
"Groovy Run Shorts – New Color"
How is the sizing on the vest? I size down in strides and in everything else wear a 6. Thx. This one is a 10 but I would have gone with the 8 for less bulk. the 8 didn't feel snug, it just looked smaller throughout. If you have a bigger chest you should for sure stay TTS because it could get tight in the chest. hmm.. that kinda bums me if I cannot run in this. I will have to try it on. I am always super super cold, so *maybe* I can get away with it.